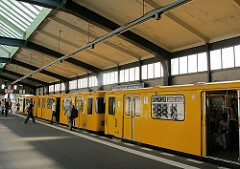 In Berlin, 500 people owning a particular set of trainers can freely make use of public transportation when wearing both shoes. The tongues of the trainers contain an annual transit pass. Such a marketing strategy has attracted an unusual mix of customers from trainer collectors to those who simply want to save on their daily commute. This unusual collaboration between a transport company and a sportswear company is something that is also shaping the car industry. Applying a technology to the logistics of a delivery service is something that is being looked into, always keeping in mind the customers’ needs.